Monsoon photography in western ghats is not only about exploring the un-seen faces of mother earth during rains or experiencing the leech bites, but also an opportunity to try out something unique and fresh – an opportunity to come back with some memorable images that makes your creations stand out from rest of the crowd. Monsoon is when the plants and trees exudes freshness and rich greens and blooms are at its best. The streams and falls are in full glory. In this blog we will be teaching you one simple yet very effective technique that can be utilised while you are shooting in western ghats in rains. Getting such an image would result you in what is known as an Orton effect that too in camera. Having said that, the technique is no brainer and can tried out by anyone whose camera supports manual mode. The concept is very simple and all that you need as a pre-requisite is to start with basics – getting your composition right before you proceed with making the image. Once the camera is mounted firmly on a good tripod and is well positioned to get an image with a composition of your choice and framing is done , navigate through your camera settings to dial in a lower ISO value ( preferably 100 or 125 ). Have a narrow aperture in the order of f11 or f16. 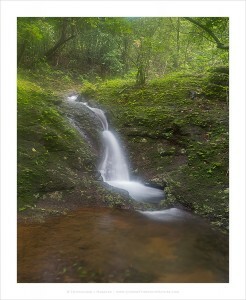 Ideally on a typical monsoon day, you notice that the shutter speed is relatively low – in the order of few seconds. Take a few test frames to check that your exposure is the way you want. Once you are happy with the outcome of your test shots, it is now time to utilise the power of timer option in your camera. Set the timer with 10 second delay and trip the shutter. With the timer counting down, blow (condensed) air on your lens through your mouth (this is exactly the same way as one would clean a spectacle glass before wiping it with a cloth). The atmospheric conditons during monsoon along with the air blown will result in formation of a thin misty layer on top of the lens. This will defocus the image getting captured on the sensor. This, when timed properly, keeping in mind the duration of the shutter for which its open, will result in images which will look as if you have seen above. Isn’t it as simple as that ?! a. Using a polariser you can add to a stop of slow shutter that mainly helps cutting the glare if there is a wet / rocky surface. b. Using a remote shutter release will help you stand beside the camera giving you better access to blow the air on the lens and then trip the shutter or trip the shutter and then condense the lens – whichever sequence you prefer. c. Ideally a shutter speed of around 5 would make it easy for us to try to time the technique in such a way that mist on the glass decondenses at the right speed so that you get both in-focus-out of focus regions in the image. d. Using a timer delay of 10s instead of 2s is ideal to ensure you get to face the lens and blow the air in uniform way and move away before the sensor is exposed. e. Shooting a slightly backlit scene with traces of light filtering through the leaves can make such images even more interesting! Its not as complicated as it sounds but once you start experimenting with it, you will start loving to make images using this technique. Hope you liked the tip, please do share your views in the comments section below or do write in to us . Also, feel free to share this article with your friends who love photography and intend to make images with a difference.